OK, call it invasion, a personal Korean Wave invasion, nyahahah! I admit, sorry about not loving my own but I never had finished a Pinoy telenovela from beginning to end, like I douse till the roosters crow at 4AM with Koreanovelas. Dang! It may be a shame to admit but I never knew any young pinoy actors now except for the contemporaries of Aga Mulach and Richard Gomez, geeeezzz! Don’t you ever ask the obvious. That’s why I’m sidetracking your attention here – This guy is to die for, I don’t mind sleeping with him for a night… bwahahah! Hopeful monkey! Lolz. He’s named Gong Yoo, sounds like a name from outer space, I mean foreign place but I don’t mind, for a change it might be cool calling someone you’re not used to. If you’re a Koreanovela ‘adik’, he’s that famous guy who fall in love with a girl, he mistakenly thought for a boy - ‘The Coffee Prince’. Right now, I’m starting to fall in love with Hyun Bin, I often skip PMC Facebook because of ‘Secret Garden’ (magkabistuhan na)… hahahah! But I swear he’s also one hell of a hottie. If it is not too much to ask, I would appreciate it if you like this blog on Facebook, just leave in your comment your profile to be liked on FB so I can like it back. Thank you! Yung "Coffee Prince" pa lang ang napanood ko kaya am not much familiar with his acting career. As for Koreanovelas, I really admire Choi Jin-Shil ("A Wish Upon a Star" and "My Rosy Life"), but it was sad that she committed suicide. Hopping here from Girls Talk, my entry is now posted, too. ay.gusto ko rin sya.i like the way he dresses up. ang linis at ang bango ng dating. Ang gwapo nmn nya... !!! I knew it..The guy from coffee prince..hahahaha I am again watching the dvd of that movie. I like how he acts so confused knowing that Andi is a guy but he's falling for "him"... He was so cute.. I am not a koreanovela fan but if a friend tells do that a certain movie was good ,I see to it to check by myself.. Now you mentioned his movies I think am gonna download those.. Thanks for the info.. Thanks for leaving some love.. Happy GT!.. Korean fan ka din pala, sis :) Guapo siya, in fairness! Happy GT! waaaa! oh my gawd! oh my gawd! waaaa! I miss coffee price. Huhu. I wanna meet him in person. waaa! HE IS SOOOO HOT! Thanks for indulging my star struck daze. Never hesitate to drop by my STREET. 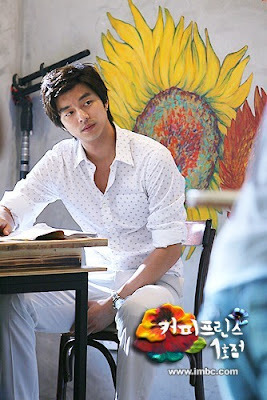 can you believe we watched coffee prince from morning to night haha :D Gong Yoo Aja aja! Cute siya! Looks like my type of guy! I feel you, haha! I think I went through the same feeling, parang infatuation ulit LOL! Hope you can visit my entry too! Thanks a lot! oh yeah! i remember him for the Coffee Prince. one hot guy, huh? am not really a fan of koreanovelas but this guy is definitely a keeper! Late Visiting from Girls! :) Happy weekend! gaaaaaaahh!! 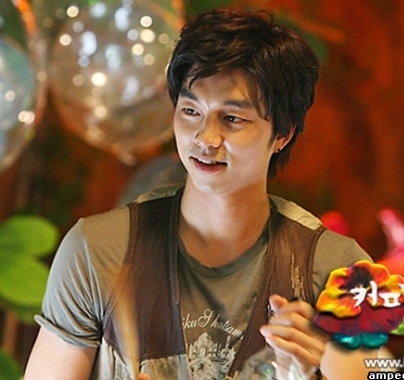 i love gong yoo too! i even featured him as hottie of the month in BQG last february ata. haha! grabe adik din ako sa coffee prince. watch mo one fine day. kagwapo nya din dun waaahhh! !